No matter which hats you wear, productboard can help you get the right products to market faster! Over the years, we’ve spoken with thousands of product managers who come to us looking for a better way to make product decisions. In our conversations, we’ve heard how PMs split their time between understanding their users, prioritizing what to build next, and rallying the team around the roadmap. Regardless of company size, product, or industry, we’ve found some common threads in the way PMs describe their roles. The product manager is truly a jack of all trades that does whatever it takes to build products that delight customers. 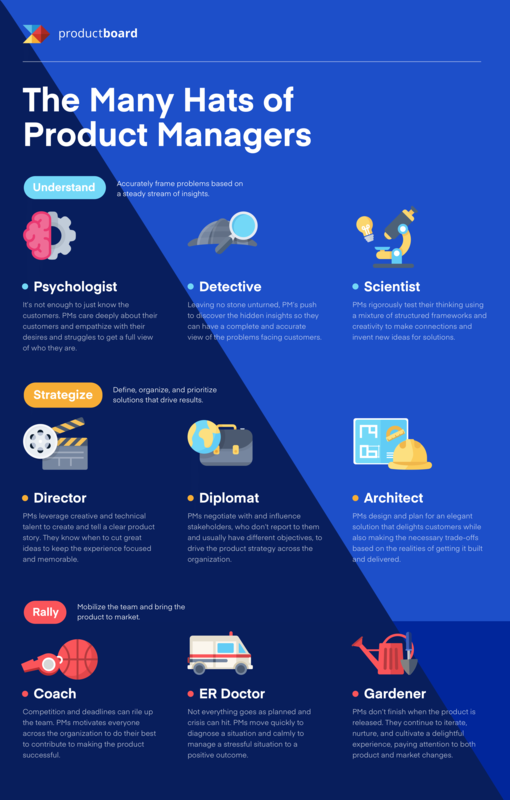 Read on for some thoughts shared by product managers on the many hats they wear and the roles they embody in their day-to-day work. What does a product manager do to empathize? What does a product manager do to invent? What does a product manager do to investigate? What does a product manager do to deal with a crisis? What does a product manager do to lead the team? What does a product manager do to negotiate? What does a product manager do to direct? What does a product manager do to coach? What does a product manager do to nurture? This post updated on March 27, 2019!